Ryan was raised in Southern California where his diverse education experiences all started. He attended public school, private school, and was homeschooled. He has seen and been part of all types of education systems, which gives him a different perspective. Ryan is a passionate educator that has made it his mission to help everyone live up to their potential and unleash their power to change the life of a child. Ryan did a fabulous job kicking Harvest Elementary's school year off. His message of Be the One for Kids was exactly what our staff needed to hear to get their year started on the right foot. Ryan has a heart for children and it shows in his ability to capture his audience and get his message across. The ideas he shared with my teachers have already paid off and I can not wait to see where they go from here. Ryan did an amazing job kicking off our back-to-school conference where we had 400 middle school educators. Ryan keynoted and feedback was extremely positive as Ryan helped set the tone for the year and reminded us all how we can be the one for kids make a difference each day. Ryan has a great message and his passion for kids and making a difference on a daily basis shines through. The message with 10 ways we can be the one for kids resonated and will be useful for educators. I highly recommend Ryan as a keynote speaker with his message for #BeTheOne for kids. Ryan was our opening day keynote for the three elementary schools in our district; his message was purposeful and timely with regards to our shared focus. Ryan's presentation was tailored based on our discussions and personalized for the audience. Be The One For Kids is unique in that its message is truly inspirational while also written to ground all educators in the WHY we come to work every day; to be that person, in that child's life, who believes in them and will work tirelessly to see them succeed. It is now October and Ryan's message and book are still at the forefront of our collective work and the energy and passion within my building is infectious. 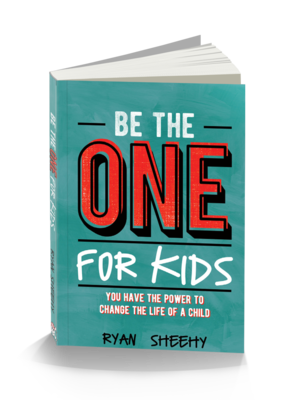 If you need, or even want, a speaker to talk to teachers about positive ways to Be The One for Kids, call Ryan Sheehy today! I had the pleasure last summer to have him speak to our district teachers about positivity, how to build relationships with students and just being there for them ALL OF THE TIME! What an inspiration for all of us Mr. Sheehy was and continues to be. I hear Be The One for Kids talk all over the building! He and his awesome message are referenced at my school consistently. At our first district professional development day, we talked about what we are doing to be the one for kids and made note cards, which are hanging in my office! It is so fun to see how teachers are reaching out to students like never before. His demeanor, humor, down to earth personality will ignite any person he is in front of. Our continued friendship and support is a blessing like no other. Ryan Sheehy is a dynamic, engaging, inspiring, and personable speaker. He captivated our audience with relevant, universally-applicable principles and heartwarming stories of real student lives transformed. Ryan was enthusiastically received by our audience of nearly 300 attendees. Positive comments such as "Ryan Sheehy was great" were frequent in our conference feedback. I highly recommend Ryan as a keynote speaker.